On 03/10/2018 myself and my good friend (both avid hunters from NZ) met Martin in Jena, Germany and headed to his home about 45 minutes drive away. This was our first experience with a hunt exchange, so we didn't really know what to expect from the week ahead. After introducing ourselves and sharing a few stories over lunch we looked over some maps of the areas Martin has access to and went for a drive around in the forestry to get a feel for the terrain we will be hunting over the next few days. 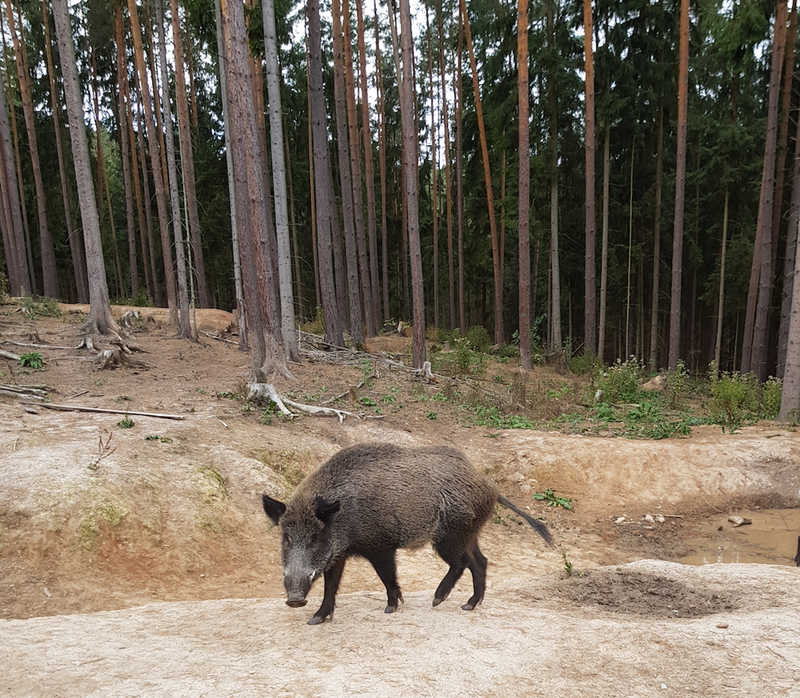 We ended up at a Wild boar training area which was something I have never seen before. 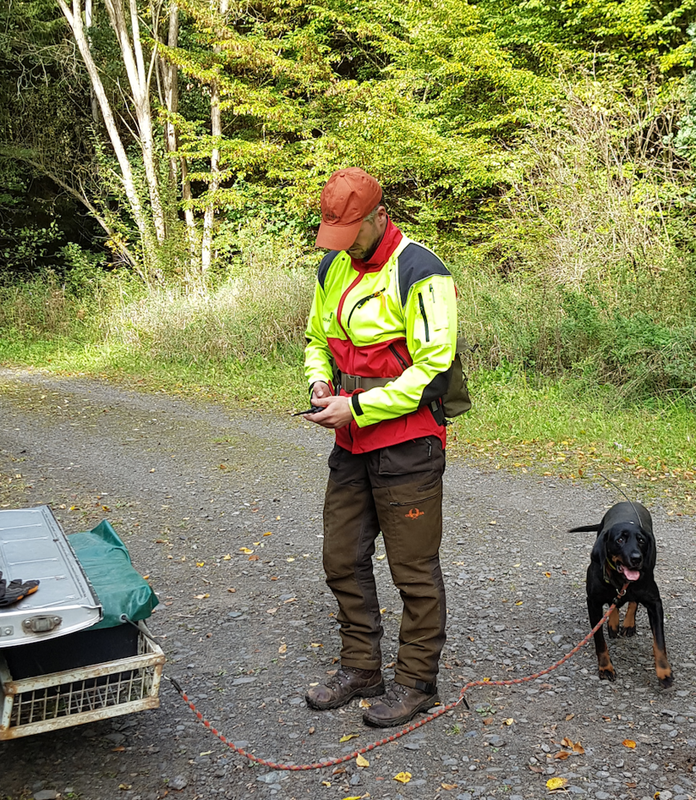 Martin is a very experienced dog handler and trains dogs to hunt wild boar using an enclosed facility. We let Martins young dog have a go at bailing a pig before getting our gear ready for an evening hunt. At around 5pm we left to go and sit in our tree stands for the evening. This was a first for me as in New Zealand we mainly hunt by stalking on foot. Luke and I were in different tree stands and it would have been about 45 minutes before I heard a shot come from his direction. I couldn't quite believe it but he has been known for having extremely good luck at times. 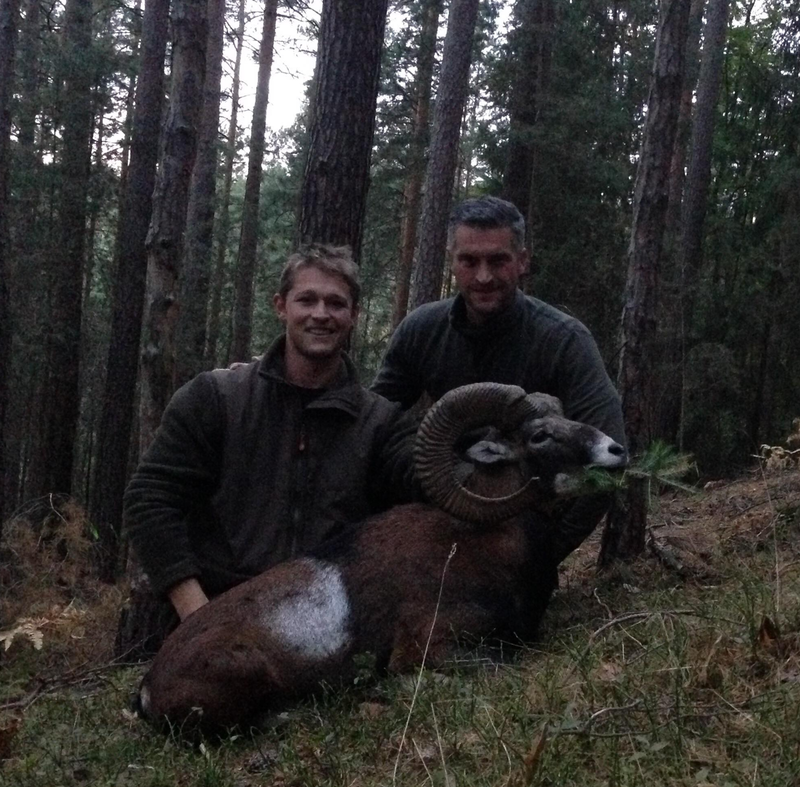 He had secured a very nice Mouflon Ram and it was only the first hunt on the first day! To say Luke was happy was an understatement. After learning a few German hunting traditions, the animal was processed and a beer and BBQ ended a great day. The following day we took part in two small driven hunts. We walked through the bush with one of Martins dogs and tried to push any game past shooters who were positioned in various tree stands. This was a very different experience for Luke and I and one that i will always remember. The success rate of these hunts seems very good and it was a very social and fun time. We saw roe deer, fallow deer and wild boar on this hunt. That afternoon we drove about an hour to the most advanced shooting cinema in Europe. 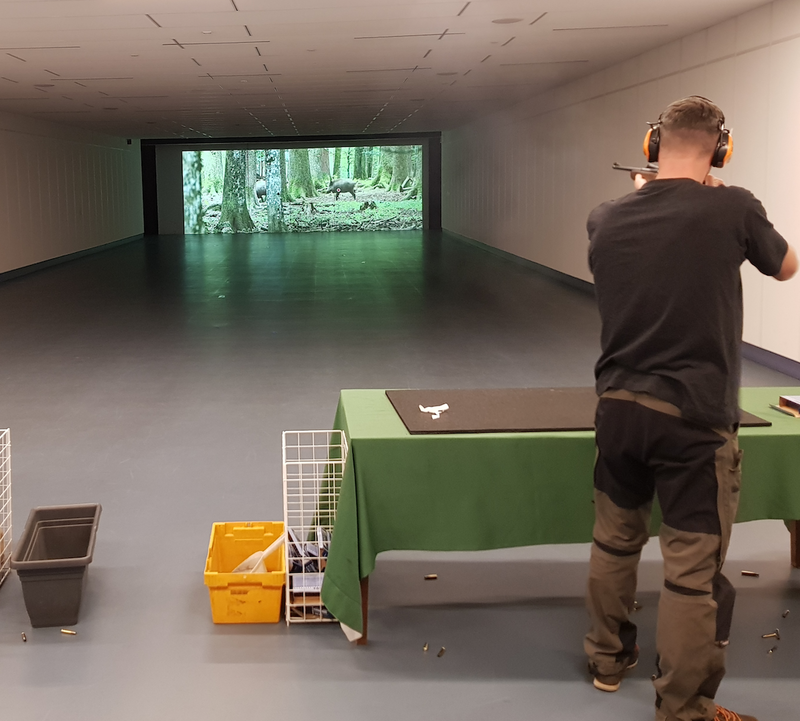 We got to shoot moving game that appeared on the screen with real rifles and ammunition. The cinema simulates animals running out like during a driven hunt and cameras track the bullet, showing the point of impact on the screen. Later in the week it was the last throw of the dice to try and get a mouflon on the deck. It was early afternoon and Martin decided to increase my chances I should sit in the tree stand for a bit longer than usual. Luke stayed back at the house as it had been a full on week already and we were both getting very tired. After an hour had passed I spotted a fellow spiker through some trees. Without too much hesitation I pull up the old 30-06 Remington and squeeze a round into the neck of the deer. I was stoked to have something on the ground but knew that after firing a round off the chances of seeing a mouflon now were pretty slim. There was only about an hour until dark so the decision was made to sit it out just in case something else came out. Half an hour went by and i was thinking about when I will get the chance to hunt a mouflon again, when out of the corner of my eye i spot what looks like a big ram standing side on at just over 100 yards. In shock I panic a bit and pull up the rifle, trying to remain calm. I see a big ram looking almost straight at me, I put the cross hairs straight on his shoulder and pull the trigger. I see him hit the deck pretty hard and roll down the hill out of sight. 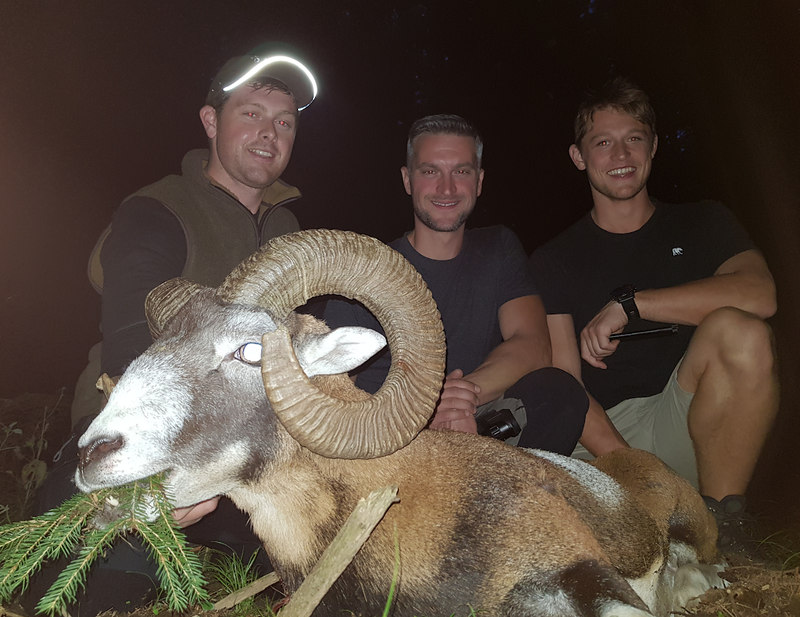 I think I just shot a big mouflon ram! I couldn't stop shaking as I get over to the animal, he was bigger than I thought and in good condition. I messaged Luke and he came and met Martin and I, he was just as stoked as I was when he saw the animal. This was the best week hunting I have ever had! Many thanks go out to Martin and his friends. The hospitality we received and our experience in Germany was amazing. Martin organised everything from food, accomodation and activities to hunting permits and taxidermists. I hope Luke and I can return the favour when Martin visits New Zealand for the first time in April 2019. I am looking forward to hunting with him again and staying up to date with his hunting blog (https://www.deutscher-jagdblog.de/).